I remember when our industry wasn't even an industry, when it was mainly a few small charity haunts that set up in perhaps an old vacant building for a one night or one weekend event. I also remember when marketing was mainly just flyers on car windows. The first professional haunted house I worked on was back in 1989, and the first time I owned my own haunted house was in 1994. 1994 happens to also be the first year I attended the Transworld Halloween retail show. One of ours sponsors was a small local Halloween retail store, and when they mentioned something about a Halloween show in Chicago, I jumped in my 1985 IROC Z28 with no hotel room and no real idea what the show was about. I just went. I remember walking through the show with Jim Kelly and being amazed to find a place where we could buy body parts, skulls and some other haunt related props. Looking back, I can honestly say there was really nothing there that we could or would use today to create a great haunted house, but at the time we thought we had found the Holy Grail! I had some cash on me, and I basically bought everything I could carry out the door, products from Cinema Secrets, Gag Studios and a few others. I'll never forget that. I wish I had a camera, because we loaded that IROC til the seams were bursting. The hatch was open the whole drive home with props sticking out. Jim even had to sit on props. Heck, I had props down near my feet while driving. And in case you didn’t know, it’s about a 4 hour drive back to St. Louis from Chicago. 1994 was a big year for me personally and for our company, Halloween Productions, Inc. We built The Darkness Haunted House and began a journey that has taken us through more twists and turns and ups and downs than I could ever explain in one article. In 1995, our company created one of the first ever how-to videos called, "How to Create Your Own Haunted House”. We bought a booth at the Halloween show that year and sold several thousands of videos. We sold more than 20,000 copies over the next few years. The next thing I knew, our company was being hired to build attractions for amusement venues like Six Flags, Cedar Point, Madison Square Garden and more. Our company was also the first to exhibit at Transworld with animations powered by control systems with air pressure. A couple years later, Scarefactory emerged as did an entire fleet of companies building and supplying haunted houses with every sort of prop, animation, effect and more. Each helped our industry become what it is today. These days, the haunted house industry is frequently featured on national television, radio and newspaper like Fox News, USA TODAY, The Today Show, Good Morning America, MTV and more. In fact, some haunted houses have been the set for a few major motion pictures. It’s been interesting to watch through the years as haunted houses evolved from black plastic and some bloody walls to today's highly sophisticated attractions that rival even a multi-billion dollar amusement park attraction found in Florida, California and more. I remember being that novice 24-year-old selling our first video at Transworld wondering if people might think “who’s this kid and what does he know”, to today feeling quite old but also feeling good, because I was there from day one and all the way through. And, I’m especially proud to have been instrumental and helped in many of the positive things that have shaped this into a true industry. When we look back at the last three decades, there have been many haunts that stand out as best, providing haunted house quality that we aspire to be like or look to for guidance. Among those are Netherworld, 13th Gate, The Darkness, the now closed Rocky Point Haunted House and more. There are many examples of haunts over the last 20 years that have successfully created their own urban legend. Such is the case with Edge of Hell. But a couple haunts REALLY come to mind as two haunts that simply inspired me as well as our entire industry. These haunts really put us on the map, paving the way for haunts to be noticed as amazing attractions. These haunts have since closed, but will always remain forefront in my mind, and they are Terror on Church Street (owned and operated by David Clevenger) and Spookyworld (owned and operated by David Bertolino). 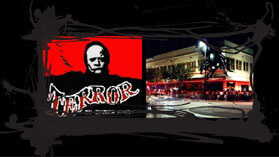 Terror on Church Street was a haunted house in downtown Orlando where adults previously came to party (prior to Disney and Universal building their own adult night life playgrounds). Terror on Church Street was the PREMIER haunt in the country with breathtaking detail, over the top actors and realistic costumes and makeup, but of even greater impact was how it inspired haunted house owners nationwide. In fact, I’m quite certain it was Terror on Church Street that inspired the multi-billion dollar theme parks to build haunted attractions inside their own parks. This haunt was quite simply the perfect template for how to build a professional indoor haunted house. As Universal and Disney built nightlife segments of their own, the nightlife of Church Street Station diminished, and eventually Terror on Church Street sadly closed too. How many “Terror on Somethings” are the names of haunts today? Terror on the Wharf, Terror on the Fox, Terror on the Ridge, Terror on Rural Street, Terror on 23rd, 36th, 20th, 12 and more. Were these names derived from Terror on Church Street? Maybe, maybe not, or maybe not directly, but either way the name certainly set a precedent in our industry. Spookyworld in my opinion had the biggest impact of all as the owner, David Bertolino, accomplished things that didn't even seem possible at the time. He had lines that stretched for miles. They had all sorts of celebs like Tiny Tim, Bobby Boris Picket, Linda Blair, Elvira, Mickey Rooney, WWF wrestlers, and more. Spookyworld wasn't just a haunted house. Spookyworld was the first ever haunted amusement park equipped with stage shows to entertain people while they waited in line for hours, and it was the first haunted house to create a national spotlight on our industry when Tiny Tim got married on the Jay Leno show LIVE at Spookyworld! Additionally, Spookyworld sold hundreds of thousands of dollars in sponsorships and even eventually partnered with the New England Patriots! Spookyworld was the very first haunted house I ever visited outside of St. Louis, and it left a mark on me and everyone who ever attended. From the marketing to the sheer size of the event, it gave me the realization of just HOW BIG a haunt can go. There are NO limits to what can be done if you have the drive and passion to do it. I believe the combination of Terror on Church Street and the national fame of Spookyworld inspired hundreds of attractions to open all around the country including some of the biggest still in operation today! Contrary to what many thought, Haunted Attraction Magazine was not the first haunt magazine ever created. In fact, the first that I'm aware of was one created by Trisha Drain who at the time worked for Transworld. Transworld had an idea of keeping the haunts in the loop, so they created a pamphlet size magazine which featured articles written by haunt owners. Included in one ma gazine was an article written by Leonard Pickel. Shortly thereafter, Leonard Pickel and Oliver Holler began Haunted Attraction Magazine (HAM). HAM was a very important piece of our haunted heritage. It was the first organized media publication that had us all realizing, ‘we are part of something NATIONAL'. HAM featured articles about haunted attractions including one that featured Disney’s Haunted Mansion. Later, John Denley began Fright Times Magazine. Then, Jim O'Rear started Underground Entertainment. Finally, Scared Stiff emerged which focused strictly on actors. At one point, all of these magazines coexisted, but as time went by most faded away. With its main fleet of writers being the same group that produced popular haunt videos, Fright Times grew in popularity. Writers like John Denley, Rich Hanf, Larry Kirchner, Kevin McCurdy and more, allowed Fright Times to have a fighting chance, but it too faded away. All the while, Haunted Attraction Magazine continued to produce one magazine after another. Then, Hauntworld.com announced we would produce a magazine. Hauntworld Magazine launched with a new format, to focus strictly on the business side of haunting appealing only to those who owned and operated haunted houses (or those who aspired to). Hauntworld Magazine went on to claim thousands of subscribers and be featured in thousands of news articles, TV shows, and more. It became the more popular magazine. However, it was always Haunted Attraction Magazine that was really the first media outlet for those who loved haunted houses and Halloween. HAM became a defacto haunted house association in a sense, because anything that was happening in the haunt industry was passed along through the magazine. HAM was also the first to bring buyers and vendors together for the first time creating a spot in our industry’s history that cannot be denied. The magazine sought out relevant advertisers which in and of itself helped create the awareness that we are in fact an industry. Oliver would sell his shares of the magazine to Leonard, and Leonard eventually sold the entire magazine and website to John Kennedy. Technology has changed the haunted house industry over the years. I can remember the days when audio was only in the form of cassette tapes and you recorded the same thing over and over again. You played it and when it stopped, you’d flip the tape and play it again. Later, we found endless loop tapes. Then came CD's on repeat mode, and today we all use digital audio. Even digital audio has changed. At first digital audio repeaters still needed amps and wires. Then, they came pre-amped, and now you can place your repeater right next to the speaker. More technology emerged such as video audio repeaters and control systems which allowed haunters to control everything inside their haunted house. Plus, computer animation allowed us to create ghosts, high quality TV commercials and much more. Most all technology we use today has rolled downhill from Universal, Disney or Hollywood movies. As that technology became cheaper to produce, it became affordable for haunted houses. Much of the technology originally developed to create 100 million dollar rides 10 years ago is now affordably priced for haunted house use. Much of the high dollar special effects can be reproduced for pennies on the dollar today. The quality in many haunted houses has caught up to Disney and Universal parks as well as Hollywood movie sets, leaving them always in search for the next big thing. Meanwhile, haunted houses lurk in the shadows waiting for the day the new technologies become available to the mass markets, so we too can capitalize on those new effects. It’s a never ending cycle of possibility! Technology has changed so much about the haunted house industry. High speed internet, the creation of promotional videos, audio advancements, control systems and more have all advanced our industry. In some ways, haunted houses are even more advanced than many rides you’d find in a major theme park as most of those rides where built in the 30 years ago. Today haunted houses have access to technology which at one time or another seemed impossible. Flame effects, multi-motion animation, digital sound and video, advanced lighting, computer animation and so much more is available now. Even their locations have changed. In days past, haunted houses were typically located inside an old abandoned house. Today many haunts are fabricated inside massive buildings and complexes fully equipped with effects, control rooms and more. The original haunted houses consisted of had black walls and dark corridors with actors roaming around in bloody t-shirts chasing you with chainsaws. Today’s haunts create new ways to use technology to WOW their customers into believing they’re the victims of a live action Hollywood movie. Are haunted houses still haunted houses or have they developed into live interactive big budget Hollywood movies? Which is better to the paying public?...Watching an explosion on the big screen or FEELING, HEARING and SEEING that same explosion just 15 feet away at a live, interactive attraction? Knowing how hard it is to compete for press and dollars during the HAUNT season, Hollywood seldom opens horror movies in October. Haunted houses have surpassed horror movies in terms of value and experience for the dollar. Horror movies are on a screen, and no matter how many special effects they throw out there, it’s still just a screen. A haunted house has live, in-your-face interaction around every turn. Technology has transformed what vendors can produce for a haunted attraction owner. Each year we visit the Haunt Show and we wonder, “What crazy prop, effect or animation will someone present this year?” We watch message boards on Hauntworld.com and we see just one more modern marvel after another being created. We see the results on YouTube, at tradeshows/conventions and more. We keep wondering, “Is there a limit to what can be done in a haunted house?” Not as long as technology continues to advance our society. Chainsaws, masks, blood, vampires and ghouls will always have their place in the modern day haunt, but technology has sunk its teeth into this haunt industry bringing limitless possibilities. The history of tradeshows is a long one, and I'd rather not bore you to death. However, ours have transformed many times over the years, and with each transformation, the haunted house industry benefited. Way back when Transworld first introduced the Halloween and Party Show, it was all retail. There was no haunt section. In fact, the word HAUNT was never spoken and nowhere to be found. But haunters eventually began to come, and like a bad rash, we multiplied and spread until the point of taking over the entire show. Retailers started to notice just how many of their FORMER haunt owner customers were in attendance as we now bought costumes direct at the show. The retail vendors started to despise the catalog collectors among us. Many of those vendors started pushing Transworld to boot the haunt industry out of the show. In fact, one year Transworld came up with all these new rules for haunt attendees. Well that didn't set well with Hauntworld. After all, the haunt vendors and the retail vendors had to pay the exact same booth price, and no one was restricting the retail vendors’ customers from attending the show or certain parts of the show. But new rules were passed anyway. A feeling of being an outcast, a second class citizen, and not good enough, all rang throughout the industry. Many buyers declared they would boycott the show altogether, which would really only hurt our new and growing industry. During the first year of the new MHC convention, several vendors and haunt leaders came together for a private meeting in Columbus, Ohio, and it was determined that haunt vendors and buyers alike would stand firm to send a unified message to Transworld that this would NOT FLY. Transworld did drop the new rules but instead utilized stickers and colored wristbands, so retail vendors could easily identify you as a HAUNTER and refuse service. This compromise did not satisfy the retail industry. Nor did it satisfy us, because again their message we heard loud and clear, “we don’t sell to your kind.” With Rubies at the forefront, these issues climaxed until everything came to a head. The retail industry (backed by Rubies) would start a new show in Houston, and the haunt industry would take a course that would forever shape our industry. Clearly a separation was inevitable, because the haunted house industry could not possibly thrive under the rule of the retailers. Plus, the haunt industry needed its own focus so more potential buyers could be found and more relevant companies could be brought in to sell to us. This was a vision I personally backed. If we could break off from the retail side with a tradeshow promoted just for haunt attractions, many would discover our industry is bigger than ANYONE realized. I was told over and over again, ‘you can't make a show out of that small haunt section at the retail show’. To that I would point out the number of retail exhibitors who DO sell to both sides already. Plus, I would drive home the fact that if companies from IAAPA knew it was an ATTRACTIONS show and not a RETAIL show, they would exhibit. After all, a show for ATTRACTIONS would draw a lot more relevant vendors that haunted houses need. After Rubies set up a new show in Houston in direct competition of the Transworld show, the writing was on the wall. The division inside the retail industry had created a sinking ship that our haunt industry was still aboard. To avoid going down in the wreckage, we flew into action. With Hauntworld at the forefront, we convinced Transworld to develop and promote a new show strictly focused on the ATTRACTIONS of Halloween. Against their initial judgment, Transworld agreed. And with the right focus and dedicated marketing efforts, Transworld has now realized the true potential of our industry. To Transworld's credit, they risked everything in 2008-2009 to produce our first tradeshow, and today Jenny Thaler works on haunts ALL YEAR LONG. She’s created seminar series, haunt tours, events, and more even outside the March show. I’m sure at first Jenny felt like a victim being dragged to her slaughter, but I believe she’s now proud to have “haunting in her blood”. The job is not done, but Transworld continues their focused effort towards ever finding new buyers, new vendors, new seminar topics and more. Now that Transworld understands the difference between an attraction and a retail store, the potential is limitless and exciting. Prior to the age of Photoshop, much of our marketing materials consisted of clip art, typeset flyers or coupons and hand drawn logos. Looking back now, how horrid were the old t-shirts you wore at your attraction? A haunted attraction today that hasn’t created its own unique, digital artwork is like a long lost tribe still living in the middle of the Amazon. I can remember one year going to the Transworld Show and exhibiting were two guys who looked like they just got back from Woodstock selling logos. I remember taking their business card reading Brainstorm Studios, but at the time I just couldn't see the value in spending that kind of money for a logo. Several months later, I called. These guys changed our industry to a degree that I think most of us can't even remember what we had used prior. A first impression is everything and the artwork that Brainstorm Studios created took our industry from the clip art realm into the WORLD of Hollywood style movie posters, artwork, custom designs, and so much more. I remember some haunts telling me that their Brainstorm Studios artwork was so good that some customers complained of false advertisement. After haunt shoppers saw the artwork and the realistically scary environment Brainstorm created, they attended the haunts, and as customers they expected the attractions to match the level of the logos, posters, etc. only to find that the haunt didn’t deliver and in some cases were still stuck in the 80's. How did this artwork really impact our industry? Complaints from customers about not seeing the logo monster from the artwork in the haunt itself led haunt owners to create ICON characters creating costumes to match their logos. Complaints that the theme of the artwork wasn't actually the design of the haunt itself led haunt owners to more creatively design and develop their haunted house into more elaborate set designs developed around a theme and even a STORYLINE in many cases. Today, haunted house marketing is ramped up from television commercials, YouTube videos and websites to the professional photography taken of our attractions. Everything seems to mimic just how Hollywood would promote a new movie. I know prior to Brainstorm Studios no one put much effort into their image but now they do. In fact, Brainstorm Studios was even hired by Spookyworld to redesign their classic logo. Brainstorm Studios continues to put forth amazing artwork specialized to the haunt industry. Today, there are many designers out there, but it all started with Brainstorm Studios. Every web designer and graphic designer selling to the haunt industry has Brainstorm Studios to thank for creating that initial demand in the industry. As haunt owners, we have Brainstorm Studios to thank for re-creating our haunts’ image and the image of our entire industry and for playing a huge role in the new age of record attendance we now enjoy. Back in 1994 when I first visited the Transworld Halloween Show, there was only a handful of vendors selling to the haunts: Distortions, Cinema Secrets, Gag Studios, Don Post, Morris Costumes, and a few others, but the biggest was Distortions. Distortions mainly created products for Morris Costumes including masks, body parts and props. Distortions was the only company outside of Cinema Secrets which seemed to focus more on horror related products for haunts. (Back then, Cinema Secrets was mainly a haunted house vendor too, but later transformed into more of a costume vendor.) Distortions never abandoned their haunted house root s, and instead expanded it, took risks, and even perhaps gambled everything on the hopes that more haunts would become buyers at the Transworld Halloween retail show. Distortions created an over-the-top, never-see-before, never-attempted-before animated prop. It was something so expensive they themselves weren’t sure if it would draw a single order. This motorized Distortions prop was called "The Electric Chair" and its price tag was about $4500 which was quite hefty especially in those days. Not only did Distortions write more than one or two orders, but they blew the roof off the building selling HUNDREDS of them. I remember installing an attraction in Denmark and visiting a wax museum while there, and low and behold there was The Electric Chair. Another time I was visiting an attraction in Orlando and BAM another one. It was like every haunt from coast to coast had The Electric Chair. Haunted houses like my own made it the staple exhibit in our queue lines and even invited the media to come out to film the electrocution. Why is The Electric Chair so significant in our industry’s history? It single-handedly elevated haunted houses to new heights, and it brought the realization that haunted house owners were willing to spend a lot of money on high tech items. The idea that there were so many haunts out there willing to dole out tens of thousands of dollars to buy props, animations, and special effects inspired a revolution of new vendors to our industry. 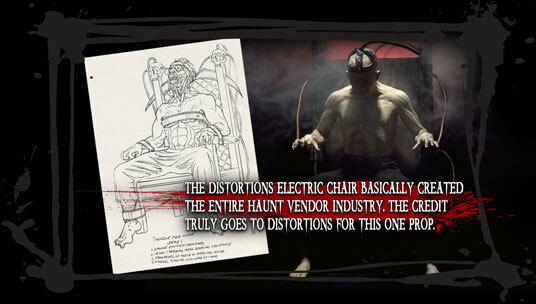 The Distortions Electric Chair basically created the entire haunt vendor industry. The credit truly goes to Distortions for this ONE prop. The year following, our company showed up selling the first air-driven scare products including the first air cannon for under $500 and an Attacking Werewolf which we sold nearly a hundred of. From there, even more companies emerged including Hollywood artists and effects people with all sorts of animations and props. Many haunt owners who had been making props for themselves began buying booths to market their props at the show too. Hence, the haunt vendor industry was born! 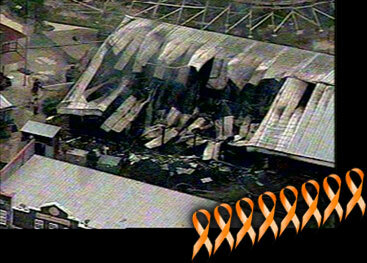 May 11, 1984, a fire broke out at Six Flags Great Adventure and killed 8 teenagers forever changing the haunted house industry. In lawsuits filed, it was argued Six Flags should have had sprinkler systems, smoke alarms, and other safety devices, and had these devices been installed, those teenagers could be alive today. The a ttraction was a Haunted Castle style haunted house constructed originally from four semi-trailers joined together, then later expanded to 17 trailers. It was determined the fire was started by a customer trying to find their way with a cigarette lighter. Fire inspectors testified that they had never inspected the attraction since it had been deemed a temporary event. The castle structure lacked a building permit, sprinkler system, alarms and other items. A fire broke out around 6:35pm and was fanned by outside air conditioners causing it to spread quickly to the many flammable materials and props (including foam) inside the attraction. In the aftermath of the fire, several haunted houses across New Jersey and across the country were closed pending inspections. States across America passed new laws for dark rides and haunted houses including sprinkler systems and other safety features along with the requirements for annual inspections. Safety in haunted houses today can thank the sacrifice of Joseph Beyroutey, Nicola Caiazza, Jose Carrion, Tina Genovese, Christopher Harrison, Eric Rodriguez, Lenny Ruiz, and Samuel Valentin Jr. Hauntworld pays tribute to you. The next time you start to complain about how tough your inspector is or additional safety requirements needed, remember those eight teenagers who died in 1984. Lives were lost to save countless others. The haunted house industry was barely started in 1984 and if ever a lesson was going to be learned about safety, better for it to happen before haunts became so popular. Hundreds if not thousands could’ve been affected. The haunt industry not only survived but evolved as a result. Since then, there have been no fire deaths inside an indoor haunted house. Hauntworld.com began in the mid-nineties as an online location where haunters from around the WORLD could come for camaraderie, friendship and fellowship. Through Hauntworld.com’s chat rooms and message boards, haunters could share ideas and help each other find and locate products for upcoming projects. Hauntworld was started by me (aka DRFRIGHTNER) and most importantly my cousin, Danny Bennett (aka FRIGHTMASTER). Danny died a few short years later at the early age of 33 of heart attack. After Danny’s death, I dedicated myself to developing Hauntworld.com into something which would honor his dream. Looking back on the day I bought the URL Hauntworld.com, I can honestly say I never imagined the magnitude and impact it would have on the entire haunted house industry. Hauntworld.com quickly became a place where thousands of people came to chat, share information and debate topics. Hauntworld.com provided information that haunts used to make their attractions bigger, better and more efficient. Many haunt vendor companies got their start on Hauntworld.com by utilizing the message boards to promote their products and services through uploading pictures of products for sale on the Hauntworld Fright Forum. In fact, many of the conventions, events, and gatherings started with using the forums as a place to find haunters to promote their events. Other popular websites like those promoting podcasts, magazines and more used the forums to find listeners and customers. Hauntworld.com eventually created a wealth of information for the media and used its position in the industry to launch one effort after another all intended to promote the haunted house industry on a national level in a positive light with one goal in mind ... SPREAD THE FUN OF FEAR! Hauntworld has also created entire series of videos showcasing haunts from all over the nation. Years ago, many haunts were skeptical about letting other haunt owners view their attraction and potentially steal their secrets, but the greatest of all haunts knew that the sharing of ideas is good not bad for the industry and so Hauntworld showcased every major haunt you could think of. Spookyworld, Terror on Church Street, Rocky Point Haunted House, Lance Pope’s 'Verdun Manor' and more all created videos for the Hauntworld video series. In fact, we showcased over 200 haunted houses over a 10 year period. Helping haunts learn from each other...that was the goal! ? ?Today Hauntworld.com has continued to promote new events, new tradeshows, new vendors, new haunts and the entire industry as a whole. Many people probably don't realize the impact that Hauntworld has had on this industry or how much helpful information you've picked up and/or shared via Hauntworld.com through the years. For us to produce those first Hauntworld videos really opened the doors to sharing of information which has opened this entire industry wide open. The impact is without question, and the credit goes to you all. The mark was created by YOU the haunts who shared, learned and traded ideas, information, video, photos and more. In essence, Hauntworld.com was the Facebook of haunting long before Facebook ever existed. Hauntworld.com continues today with its popular magazine, haunt directory, videos and of course the WORLD famous FRIGHT FORUM Message Board. We’re proud to be doing the same thing that Danny Bennett set out to do back in the 90's, to communicate with other haunts! “Danny, if you are looking down…Mission accomplished and THANK YOU! Thank you for the day you walked into my house and showed me that silly website you made called 'Haunted Houses of America', inspiring me to take this journey with you.” Danny deserves ALL the credit for everything and I hope when you are ever in St. Louis just maybe you'll stop by his gravesite which has the inscription 'FRIGHTMASTER'. Before the internet ever came along, or should I say before high speed internet came along, haunted houses relied strictly on local advertisement, most specifically radio stations. Additionally, all haunts relied heavily on answering phone calls from potential customers needing directions or ticket costs or other information. Today, no phones are needed. Instead, haunted house marketing has shifted from traditional media to more of a web-based program. The internet has changed everything for small business owners because we now can reach out to more customers, not only in our local area, but our entire state and even across America. The internet has created all sorts of media attention for our industry. Anyone can start or create a news website, a blog, a review platform etc., and they are hungry for content. The web has allowed our attractions to find new customers, educate customers, and provide readily available photos and promo videos. We can upload video to sites like YouTube where even more people can find, watch and learn about our attractions. Websites like MySpace, Facebook and even HauntWorld allow you to create pages for your haunt that can be updated daily all year round about your attraction. Additionally, you can create another page to stay in touch with your actors and other staff too. The web has nearly replaced old habits like direct mailings to customers with direct emails to customers. The timeliness of direct emails combined with the cost savings makes this switch a huge plus. Internet has also helped our industry learn and educate ourselves by visiting other haunts’ websites. Seeing other website layouts, watching their videos, viewing their photos and more is invaluable. Plus, having access to these examples and ideas anytime day or night is even more of a benefit. Internet allows us to communicate on a daily basis through haunt forums like the Hauntworld Fright Forum helping us to share ideas and information. We can find used equipment for sale, learn how to utilize new technology better, and bounce ideas off each other all to better our attractions. The web was and is simply a game changer, and creative people continue to find new ways to use the web to promote their business in ways such as creating app programs and utilizing Twitter to promote on a minute by minute basis. It’s no mystery why haunted houses over the last 5 years have experienced a massive and somewhat overwhelming boost in ticket sales, attendance and media attention. The internet could be considered the biggest evolution for the haunt industry. It enables customers to rate, review, comment, blog and spread the word about products, services and YES our attractions, good or bad. In days past, disgruntled customers could threaten to tell everyone they know not to patronize a business, and one could assume 10 friends could get that message. With today’s Facebook, Twitter, and more, someone could reach 100’s of friends and wreak havoc on your attraction in seconds. Essentially, today it’s all the more important to make your customers scream with fear. The days of fly-by-night, overhyped attractions is coming to an end. Technology of the web has enabled and empowered everyday people with the power to really sack your attraction if you overhype. Today, we are seeing the bigger haunts get even bigger and the up-and-coming attractions growing faster than they could ever imagine. Why? Because if you build it they will blog about it, they will tweet about it, they will tell their Facebook friends and your legend will grow rapidly! If you set out to build a good attraction today and if you strive to be the best at what you do, your business will GROW by leaps and bounds. You can tweet that all the way to the bank! Internet has changed everything about the haunt industry from how we operate, build and design to how we market our haunted houses. Websites like Hauntworld.com continue to send tens of thousands of qualified customers to haunts each year, just as Google, Yahoo, Bing, Facebook, and so many more. The list is endless. Today a good haunt owner should be spending as much money on his web presence as he does on his haunt. The internet is simply the best tool ever to have helped our small industry grow into a powerhouse of the amusement world. Back in 2000, I suggested to the then president of IAHA that if any haunted house association was to hang its hat on something, it should be the start of a national public relations program geared towards the promotion of haunted houses everywhere. At the time it seemed haunted houses receive nothing but bad publicity. I pleaded that any negative stereotypes about haunted houses needed to be cleaned up with a national publicity program. No one on the board disagreed with my arguments, but no one wanted to foot the bill for such a program either, nor did anyone really know how to go about putting an idea like this into action, so I decided to run for IAHA presidency myself. Becoming president of IAHA in 2005 drove me into action on this PR program idea. I started planning it and building support from others in our industry. The first thing was finding a public relations company that would tackle the job at a budget the haunters could afford. I found such a company and began to call haunted house owners from across the country who shared my concerns about how the national media doesn't understand our industry or the massive improvements that haunts have underwent over the last several years. The first person to jump on the bandwagon and help support the program was Ben Armstrong of Netherworld, and it spiraled from there. Ben convinced IAHA to donate just under half the money for the program. Several major haunts jumped on board donating money for hiring a national public relations firm. Among the haunt owners involved were Randy Bates, Brett Bertolino, Ed Terebus, Peter Karlowicz, Tony Wohlgemuth and many more. Each haunted house placed their faith in me and Ben to properly manage the national PR program and put the money to good use, and a national public relations program was born. In some ways this program was the turning point for the haunted house industry, because there was an outright EXPLOSION of media, so much so that two people, three people, ten people could not answer all the media requests for interviews including USA TODAY, Wall Street Journal, Good Morning America, The Today Show, CBS and more. Speaking of which, the most viewed haunted house video on YOUTUBE is CBS High-Tech Haunted Houses, www.youtube.com/watch?v=ig9dhC06nwU, with almost ONE MILLION views! This video came as a result of our national public relations firm pitching CBS and Good Morning America, and later someone thought to upload it to YouTube. What an impact! What a positive message about how far haunts have come! When pitched the story about haunted houses, there wasn’t a single newspaper, magazine or TV station that turned it down. They all jumped on the bandwagon of educating America about the Haunted House Industry. Next thing we knew, our efforts spiraled into TV shows on Modern Marvels, National Geographic Channel, Travel Channel and Food Network, all wanting to air episodes featuring the haunted house industry. Hauntworld.com was the first website to ever produce a top 13 haunts list, b ut due to this PR program, suddenly websites across the country wanted to publish one too, because now they know…haunted houses are big news! ? ?The goal of the national PR PROGRAM was to educate America as a whole that haunted houses have changed and now appeal to adults of ALL ages and that haunts across America are doing amazing things with effects, technology, architecture, set design and more. We drove home the message that Americans who haven’t been to a haunt in several years are missing out and should get in on the SCREAMS. Most would agree the haunted house EXPLOSION started around 2005-2006, and you can credit the first ever national public relations program! Haunted houses became known for something more than fly-by-night mazes which open for Halloween weekend. Now they’re credited as the major amusement attractions they truly are, offering sophisticated entertainment appealing to masses of people. As a result, haunted houses over the last 5 years have seen their attendance climb. Ticket prices were able to increase and ticket sales have soared. This flux has filtered across the entire industry too, because now haunt owners have more money to spend on props, masks, animations and more. Vendors now create bigger props with more technology and on a greater scale. Even a full blown tradeshow specialized for just the haunted house industry was able to emerge and be successful for the first time. In the past, even Transworld doubted whether our HAUNT could support its own show, but today Transworld’s eyes are open to our expanding revenues, expanding attendance and expanding credibility as a legitimate industry. There was a master plan, and it was explained to everyone industry wide (from vendors to haunts and anyone in between) that this haunted house PR program would benefit all. David Fauchman of ScareFactory agreed and offered to donate funds to the program. As a vendor he understood that if haunted house owners create additional revenue from rapid growth that prosperity would trickle down to the vendors. I was told by a hundred different people this idea would fail or that it wasn't fair. Many tried to discourage me from doing it at all. Naysayers will always exist no matter what, but after the PR program was over and haunts across the country felt the results, few can deny the enormous impact and benefits of a successful national program like this. Additionally, it should be noted that I actually received a phone call from another industry’s association asking to hire me to help launch a similar PR program for them. It’s obvious the overwhelming success was noticed around the world! The following year, another public relations program was launched again by Larry Kirchner and Ben Armstrong, and although it was very successful, it was not nearly as successful as the first. Since then, many other groups, associations and more from America Haunts to IAHA all launched their own version of the same, but none even came close to matching the success of the very first one. It’s because of the effectiveness of the very first program that PR campaigns today have limited success. National media outlets feel they’ve already done that; they’ve already covered the haunted house topic. But that doesn’t change the fact that haunted houses are still feeling the positive benefits through a MUCH higher awareness within both our local media circles and on a national level too but on a lesser degree. Had the first program back in 2005 not been as well received, annual programs would be necessary to continue the message, but the utter saturation of stories over the past couple years has left us in a very fortunate position. We don’t necessarily need to spend those kinds of dollars, not annually anyway. The media is no longer clueless about the advancements in our industry. Haunted house have finally been given the recognition they deserve! Haunted houses received more attention in the past 3-4 years than in the previous 20 years combined. Now it’s YOUR turn. I implore you. Go out and hire a good PR firm in your market and take the ownership of haunt stories circulating to Good Morning America, Travel Channel, USA Today, Wall Street Journal, CBS, FOX and more. Inside that message, showcase YOUR haunt’s successes and turn them into stories about your haunt where it counts most to you…your town, your city and your state as well as nationally! Doing so will not only impact your haunt business, it will positively impact our industry as a whole! Where did haunted houses start? Who opened the first ever haunted house? How did this industry find its first roots? Some will say it started with ghost shows, but I disagree. The reality is that the haunted house industry got its start as cheap attractions in small family owned and operated amusement parks, amusement piers and such. Way back when, there were no roller coaster or ride companies to buy an attraction from, so many of these amusement piers simply built their own attractions locally and some built haunted houses, haunted dark rides, and haunted funhouses. Typically, these attractions were cheaply created, very dark, with buzzers and loud noises going off around every turn. Some of these older style haunted dark rides still exists today. One example is located in Knoebels Amusement Park called 'The Haunted Mansion' which opened in 1973. This is what is called a 'pretzel dark ride'. While many would call it outdated, cheesy and in desperate need of a modernization, the folks at DAFE (Dark Ride and Funhouse Enthusiasts) continue to rate this dark ride as their favorite, because it’s a throwback to the past. There are few examples of these old dark rides, because many have been removed, destroyed or renovated. Disney also built a haunted mansion themed dark ride. After all, a haunted dark ride or funhouse was one of the main attractions in most amusement parks throughout the early years, and they continue to be a staple for many. Haunted houses are clearly rooted in the older dark rides and funhouses, which inside most amusement parks was either a 'pretzel dark ride' or it was a 'walk thru'. Several years later, charities latched onto the idea building the same or similar attractions in their local towns and cities to raise money for their cause. Back in those days, there were really no means to communicate on a national level for promotion of the idea other than conventions. In 1975, one such convention for the annual Jaycees was held in Miami, and it just might have been the start of the haunted house industry as we know it today. In February of 1975, two men of the local Jaycees chapter in Bloomington, Illinois got together to discuss the creation of a haunted house book. Those men were Jim Gould and Tom Hilligoss. Tom's book was well received by the Jaycees printing over 20,000 copies. From there, he decided to purchase a booth at their national convention setting up a miniature haunted house display. Tom's display went over so well he decided to form the first ever haunted house company called 'The Haunted House Company'. The Haunted House Company went on to hire a staff and due to continued growth hired even more staff to coordinate all activities of the company. Later, The Haunted House Company went on to introduce a line of custom monster masks from Don Post. They became a hit so much so that they had orders from 700 Jaycee chapters in 40 different states. Hilligoss became the first ever HAUNTED HOUSE EXPERT in America helping the Jaycee organization to set up haunted houses claiming revenues of $500.00 for small markets and up to $50,000.00 for larger markets. The first ever haunted house seminars occurred as Tom began traveling to cities across the country to different chapters offering up to 30 different seminar options and workshops. The Haunted House Company even hired a cinematographer and took the first ever HAUNTED HOUSE TOUR of 35 haunts in Colorado, Missouri, Michigan, Ohio, and more gathering information and photos for their seminars and presentations. In 1976, The Haunted House Company expanded to include services to sell four-colored t-shirts, sweatshirts, jackets, bumper stickers and artwork for billboards, as well as complete lines of costumes, makeup, spiders, sound equipment, lighting equipment, and lighted signs for promotion. Tom's company, books and seminars showed the Jaycees how to build a haunted house from which scenes were best to marketing a haunted house. He even gave them clip art, coupons, tickets and everything between. The Haunted House Company was so successful that Tom made the following claim...If Jaycees continued to increase and improve their involvement in the haunted house program, someday Jaycees would OWN Halloween! His goal was for people to automatically identify with a Jaycee Haunted House when thinking about Halloween. Tom had the foresight and the vision to realize that haunted houses truly could “own” Halloween. The Haunted House company would go on to introduce the idea of taking Polaroid pictures to increase revenue, and they even coined the phrase, “We'll Scare the Yell Out of You!” The Haunted House Company had everything going their way. They started it all with books, seminars and tours of haunts across the country. They were the first to bring back information from haunts all over the nation. The Haunted House Company even went on to develop a Christmas attraction called 'Santa's Workshop' and much more. While most Jaycees lacked the entrepreneur haunt spirit needed for success in today’s market, still Tom Hilligoss promoted the opening of haunted houses across the country even way back when. Eventually, young business minded people in the mid 1980’s picked up and started to open haunted houses of their own. They acquired better locations, relied on a paid staff of actors rather than volunteers, purchased tons of radio ads, spent months not days creating their haunts and literally overnight the Jaycees format was on its heels. No longer would radio stations give out free advertisement for the Jaycee cause, not when other haunts would pay for it. Another dagger in the Jaycees plans was the Six Flags fire, because it nearly wiped out the idea finding an old abandoned house for setting up a haunt. Fire departments started inspecting and requiring costly safety features. These new ad and safety costs had most Jaycees abandoning their haunts and looking for new ways to raise money, but some still survive today putting forth a new quality of event to compete against any stiff competition that crept their way, most inside smaller rural areas, and they still scare people every Halloween. One such survivor is the Huntington Indiana Jaycees who put on a quality haunt event year after year known as The Huntington Jaycees Haunted Hotel, www.hauntedhuntington.com. I believe the number one most important event in the creation of the haunted house industry as we know it started with a haunted house coloring book created by Tom Hilligoss and Jim Gould over a coffee table in Bloomington, Illinois. A plan was laid out to help create an entire industry of fear that did indeed go onto scare the “YELL” out of Americans. Yes YOU! You played the most important role in bringing the haunt industry full circle, because it was you who risked your life savings taking leaps of faith and probably quit a very valuable, full-time job to work on your haunted house everyday of the every week. You believed in your passion creating an undeniable artistic expression of entertainment which makes people in your town SCREAM with delight. You signed up for the seminars, attended the haunt tours, bought the videos and magazines, shared ideas with other haunters through the Fright Forums, and simply dove in head first. You made the commitment to improve your haunt and to invest amounts of money against the advice of others’ better judgment, but YOU BELIEVED! No matter what drama filled non-sense might have happened within the industry, you still believed in the haunt industry as a whole. You knew its potential. You stood by the right people. You watched it all grow and become a true haunt industry with a clear path for the next generation of our industry. When the haunt industry was at its lowest, you stood tall and fought through. When your local fire marshal or building inspector told you “no”, you found a way to turn it into a “yes”. When your family or friends expressed skepticism, your determination grew and you showed how wrong they were. You have taken your haunted house from one level to the next new level and beyond. You've invested, upgraded, listened and learned! Without YOU there would be no industry. No matter if you are the smallest haunted house in the country or the largest haunt vendor in the world, no matter if you are a home haunt, a charity haunt or a professional haunt, we all promote Halloween, and we ALL promote haunted houses in a positive light. We promote the idea that being scared can be more fun than anything you’ve ever experienced. Haunted houses are fun, intriguing, exciting, sophisticated and the rush is just as good as anything you might find inside those multi-billion dollar theme parks. You did it, and without YOU, we wouldn't be here today with our very own tradeshow, plus conventions, national media attention, TV shows, and more. We own a have a business that we enjoy, a business of scaring people. And we continue to build a local tradition that your children's children can carry on for generations to come!